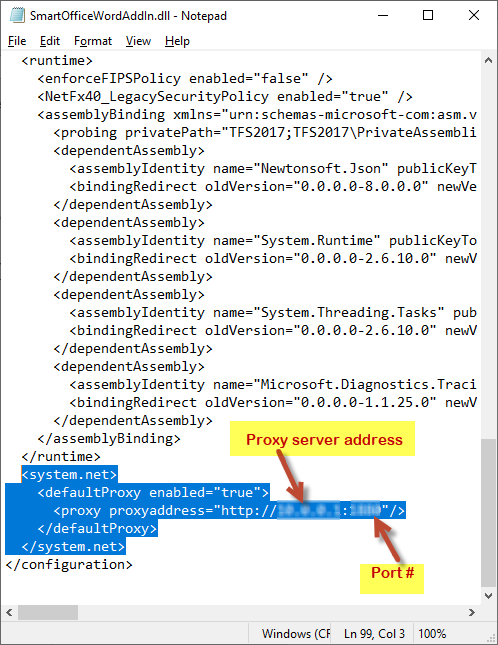 When trying to Add a TFS Server I am getting a (407) Proxy Authentication Required message. The Error message is FT31022: Unable to Connect to team Foundation Server. Is there a way for me to enter the user name and password that I used to access TFS online? 1)- Go to the config file in SmartWord4TFS installation directory location. 2)- Find config file "SmartOfficeWordAddIn.dll.config" in installation folder. 3)- Open it in any editor to modify. <proxy proxyaddress="ProxyServer:Port"/> \\Please replace ProxyServer and Port with Organizational Network respective settings.. This will allow to make connection, make sure to use the correct proxy server name or IP address which is in use in organization. After completing these steps, config would look like as attached snap. Error '407 Proxy authentication required' indicates that the client must now authenticate itself with the proxy. This error is normal in networks where authorization is enabled (most networks) and can occur once per sip request and is generated by the network. If you are continuously getting this error, either you have entered Incorrect Login Information (username/password), or your account has not been provisioned or set up properly. It could also occur if user does not have any Visual Studio Or Team Explorer installed and system/network is blocking to download required library files from MR server( as for this condition SmartWord4DevOps show popup and ask to download required library files.). 2. Open Visual Studio Team Explorer and connect with your desired TFS server from it. 3. Once connection is made successfully, Go to SmartWord4DevOps and try scenario. 1. Uninstall SmartWord4DevOps and Re-install SmartWord4DevOps again. 2. Open Visual Studio Team Explorer and connect with your desired DevAzure/VSTS account from it. Hopefully your issue would be resolved. Kindly let us know if your issue still persists.